We design, make, ship and erect aircraft hangars of all sizes including double A380 hangars, double 747 hangars, A380 hangars, single 747 hangars, wide span or cantilevered and light aircraft hangars. We do the complete structural design and construction and use only the highest quality British Steel which can be supplied hot dip galvanized if required. 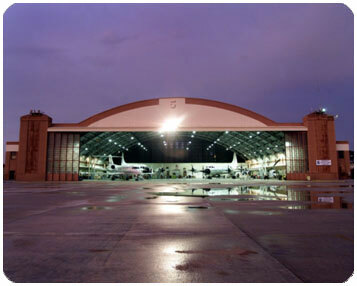 We can arrange shipment and erection of aircraft hangars to most countries in the world. Freight terminals and Distribution Centers - Commercial entities involved with movement of goods is an ever-growing business word-wide. As trade expands, the need for freight terminals and distribution centers also expands. Thousands of tons of equipment, vehicles, airplanes and moving parts need to be contained within your structure. Wood and stone are no longer options for handling this massive influx on a modern level. The need for durability in such places is of utmost importance. Your structure needs to be able to withstand being hit by large boxes, pushed against by trucks and loaders, and able to protect any items housed within them. The only way to ensure this protection while reaping the advantage of cost-effectiveness is by converting your old wood and stone structure into a steel one. We can assist you in making the right decision. We will find out about your business structure and your distribution channels, and help you to design the right structure for your business needs. We design and make all our own manual or electro-mechanical steel framed, single skin or double skin insulated doors, with roller bearing, machined steel wheels running on ground rails. Our system allows any door to be operated without moving other doors, or they can all be opened together. 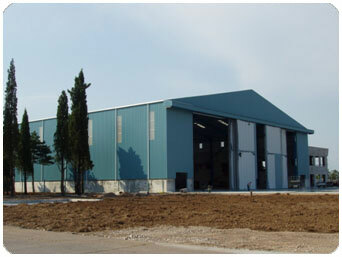 The doors are of steel framed bolted construction and clad in materials similar to the wall cladding of the hangar, single skin or insulated. Whether it was a roller shutter door, sliding door, multiplex doors or full span up-lift doors, we will design, manufacture and install it with maximum safety requirements and with wide range of control options.